LAS VEGAS — After a 402-hand marathon final table, poker professional Greg Merson sat with all the chips in the 2012 World Series of Poker $10,000 buy-in main event. 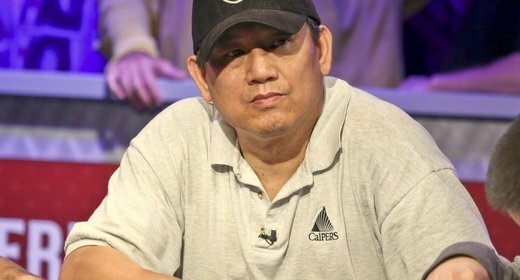 Merson has played more than seven million hands on the computer over the years, but still wallowed in obscurity among the poker community. Thanks to the WSOP main event final table this week, he became a poker legend and one of the game’s most recognizable faces. “I’m trying not to cry,” an emotional Merson said immediately after the win. 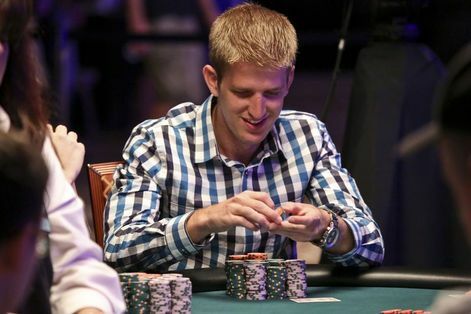 Merson, a 24-year-old from Laurel, MD., finished off a starting field of 6,598 at around 5:45 a.m. local time Wednesday to scoop $8.5 million and the prestigious no-limit hold’em championship bracelet — worth a six-figure sum in raw materials. The victory was his second of the 2012 World Series. Merson won a tournament in July for more than $1.1 million, a performance that solidified his standing as a professional on the live circuit. His main event journey wasn’t smooth. Merson was down to just a couple of big blinds with about 150 left in the event, but with a lot of help and a little patience, he managed to emerge from the short-stack abyss and rebuild. “I knew I needed to get a little lucky and double up once or twice, but after that, I thought it was entirely possible that I could run it back up,” Merson said. Merson’s aggressive style delivered, especially as play became shorthanded — a variation of poker that he usually dominated on the Internet. He said he thought he was the best player at the final table, and he ended up doing everything to justify that hubris. Merson’s climb through the poker ranks mirrors his treacherous battle with synthetic heroin and cocaine, addictions that he overcame most recently in December of last year. He called his detoxification in a hotel room at Aria casino the “worst week of [his] life.” He told Card Player that he could have — or perhaps should have — died from his habitual drug use. He said he has been clean ever since. Merson declined a drink after his win, adding that he has no fears of relapsing into drugs or the lifestyle that put him on the brink. He said he wakes everyday to the thought of keeping his past demons far away. Merson’s friends and family seem to share the same confidence that he won’t unravel from having a bloated bank account and the fame that comes with winning the main event. Stan Merson, the champion’s father, told Card Player that the family “won’t permit his head getting too big.” He added that his son has a good support system of friends. The $8.5 million first-place prize is Merson’s only on paper and in the WSOP’s record books, as a large chunk will go to his backer and long-time friend, Anthony Gregg. Gregg was about as happy as Merson was when the final river card hit the felt. 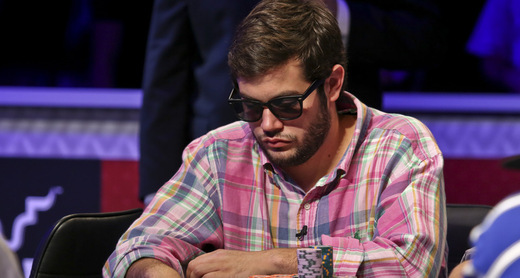 Jesse Sylvia, a Las Vegas pro, finished second to Merson and netted nearly $5.3 million. Merson grinded down his opponents for the most part, but did receive a huge gift from sixth-place finisher Andras Koroknai. The Hungarian was playing solid, until blowing up and sending his 40 million chip stack to Merson on Monday. When play was three-handed, Merson made an enormous stone-cold all-in bluff against Jake Balsiger. The hand was one of Merson’s defining moments at the final table. Despite entering Tuesday with the chip lead and starting off strong, Merson eventually lost his footing. The final three endured a 249-hand roller coaster that featured numerous lead changes and come-from-behind run outs. Not long after Slyvia suffered a bad beat to double up Balsiger at one point, Merson had Sylvia all-in and behind. Merson’s pocket kings were ahead of Sylvia’s A-K. However, the board ran out 5-3-2-8-4, and Slyvia doubled up to the chip lead. Merson no longer seemed invincible, but he managed to recover and eventually knock out Balsiger in third. Balsiger, a 21-year-old student at Arizona State, put nearly $3.8 million in his bank account. In contrast to three-handed play, which was longer, in terms of hands, than three out of the last seven main event final tables, the Merson-Sylvia heads-up match happened in an instant. After some initial betting on the final hand, Merson shoved from the button with the K 5 , and Sylvia surprisingly called off his 35-big blind stack with the Q J . The board ran out 9 6 3 6 7 , and it was all over. Merson was mobbed by his friends and family amidst a storm of confetti and a flood of flashing lights. Thanks to his run at the World Series, Merson now sits atop Card Player’s 2012 Player of the Year race. He has cashed for $9,664,179 this year. It took over 240 hands and 11 hours of three-handed play to lose the first player on Tuesday’s finale of the 2012 World Series of Poker main event. It looked like we’d have our first casualty at 11:00 p.m. PST when Jacob Balsiger moved his short stack all in holding A 10 against the A Q of Jesse Sylvia. Things looked good for Sylvia to score the knockout until Balsiger spiked a ten on the turn to double up and even the tables. The very next hand, With both players now virtually even and looking up at Greg Merson, another crucial double up kept the players locked in their three-handed battle. Sylvia raised on the button, Merson three-bet from the big blind and Sylvia responded with a big four-bet for a quarter of his stack. Merson then put his opponent all in and Sylvia instantly called with A K .
Merson turned over pocket kings and was had Sylvia on the ropes, but the board ran out 5 3 2 8 4 to give him the miracle double up. The three players traded chips for another two hours before Balsiger found himself short once again. He wound up pushing with K-J and was called by Sylvia’s A-10. Once again, the worst hand came from behind and Balsiger doubled up. An hour and a half after that, Balsiger actually took the chip lead when his pocket kings held against Sylvia’s K-9 on a nine-high flop. The two continue to go at each other when Balsiger’s top pair ran into the bottom two pair of Sylvia. Sylvia wound up turning a full house to all but lock up the double up, putting Balsiger back on the short stack. The 21-year-old Arizona State University student picked up $3,797,558 for his third-place finish, guaranteeing the remaining two players at least $5,292,889 and a shot at the $8,527,982 first-place prize. Going into heads-up play, Merson held a 3-2 chip lead over Sylvia. Here’s a look at the chip counts entering Tuesday night’s finale. Here’s what is left to play for. Card Player will bring you a complete recap with each elimination. After 135 hands and more than seven hours of play on Monday, the World Series of Poker main event final table has just three players left. Poker pros Greg Merson and Jesse Sylvia are joined by college student Jacob Balsiger to resume action on Tuesday to battle it out for the $8.5 million top prize. Balsiger, 21, is looking to become the youngest main event champion ever, but he will have the short stack with 46,875,000. Merson, one of the most prolific cash game grinders in the history of online poker, enters action on Tuesday with the chip lead of 88,350,000. Sylvia, who has been playing for a living for three years, entered the final table with the chip lead and maintained a large stack throughout the evening. He will come back on Tuesday second in chips with 62,750,000. Play will resume at 5:48pm PST, and ESPN will broadcast the action on a 15-minute delay. About 1 hour and 7 minutes remain of 300,000-600,000 with a 75,000-chip ante. Even Balsiger will have plenty to work with. It took 30 hands before the first casualty of the main event final table was Steven Gee. Gee had more or less held his ground with the 16,860,000 he started the day with until his final hand of the night against Russell Thomas. Gee raised from under the gun to 900,000 and was called by Merson behind him and Thomas on the button. The flop fell 7 5 4 , and Gee continued for 1.6 million. Merson folded and Thomas called. The turn was the J , and Gee bet 3.25 million. Thomas called once again, and the 3 hit the river. Gee thought it over for about a minute before moving all in for his last 11.35 million. Thomas, who had Gee barely covered, went into the tank for over five minutes before finding a call, turning over Q Q .
Gee stood up from the table, only able to produce 8 8 . 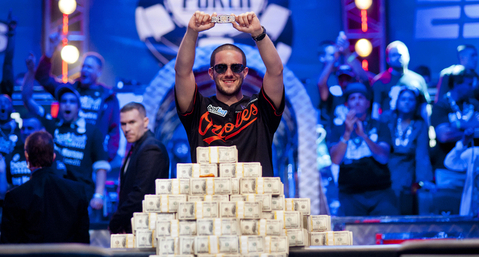 The bracelet winner from California earned $754,798 for his ninth-place finish. The second elimination at the final table was linked to a cooler not long before. 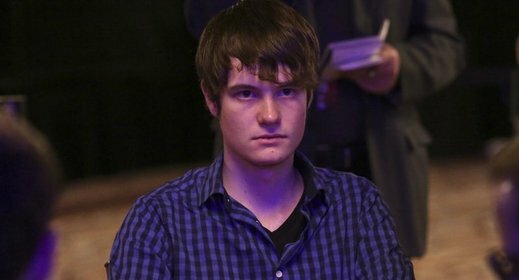 Robert Salaburu was sitting in the middle of the pack with a stack of 20 million, when he three-bet an opening raise and a flat, only to see Jacob Balsiger move all in behind him for 10 million. Salaburu made the call with pocket queens. Unfortunately for him, he was up against pocket kings and received no help. The hand left him among the three short stacks, so when Sylvia put him all in from the small blind a dozen hands later, he immediately made the call with 7-7. Sylvia’s Q 5 got there as the board ran out A A 4 2 Q . The 27-year-old Texan earned $971,252 for his finish. 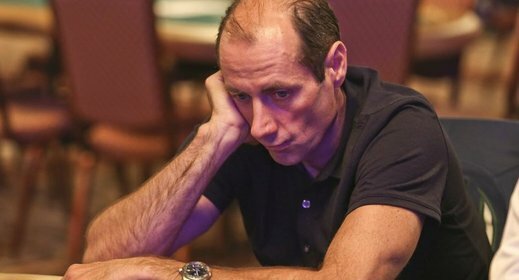 With under 15 big blinds at one point, Michael Esposito was becoming desperate. The 43-year-old came back from break apparently determined to make some moves, and after a few all-in bets, he had chipped up back over 10 million. On the very next hand, however, he moved all in from middle position with A J , only to find Merson, who woke up with A K in the big blind. The board ran out 9 7 4 6 8 , and Esposito was eliminated. The Seaford, New York native picked up $1,257,790 for his seventh-place finish. With a move that some might call a meltdown, Andras Koroknai, the 2012 main event’s only non-American, was eliminated in sixth place. It seemed like Koroknai was content not playing many hands early on. In fact, it took 40 hands before he was able to rake his first pot. However, after the elimination of Esposito in seventh place, the Hungarian pro picked up his aggression. In a span of two hours, he was able to increase his stack to over 40 million, placing him in third overall. His large stack, however, was ultimately his undoing. Merson raised to 1 million on the button, and Sylvia reraised to 2.6 million from the small blind. Koroknai then reraised to 5.3 million from the big blind, and Sylvia folded. Merson then made it 9.2 million. Koroknai moved all in for just over 40 million. Merson, sitting with approximately 43 million, instantly called, tabling A K .
Koroknai revealed a dominated K Q and failed to connect on a board that ran out 8 3 2 7 7 . Koroknai received $1,640,461 for his sixth-place finish. 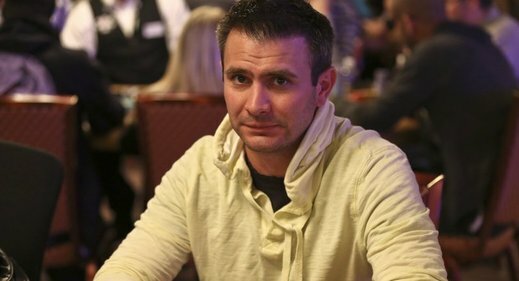 Las Vegas poker pro Jeremy Ausmus’ last hand began by him opening to 1.2 million from the button. Sylvia defended his big blind, and the flop fell 9 8 3 . The 3 fell on the turn, and Sylvia checked. Ausmus bet 1.5 million, and Sylvia check-raised to 3.6 million. Ausmus shoved for about 14.5 million, and Sylvia called. Sylvia exposed the A 9 , and Ausmus tabled the 10 7 . 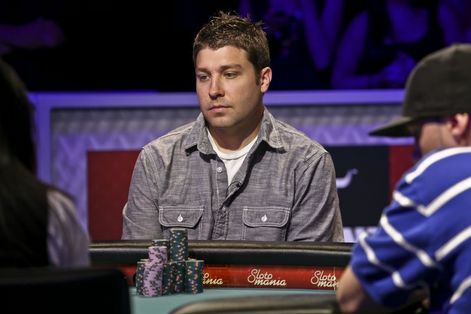 Ausmus needed help, but the river 5 was no good, and he was eliminated in fifth place for a score of $2,155,313. Thomas hit the rail shortly after midnight local time. He took home $2,851,537 for his efforts, while the remaining players bagged their chips. His last hand started with him raising to 1.5 million. His opponent Jacob Balsiger moved all in, having him covered. Thomas thought about it before eventually calling off his last 16 million or so. Balsiger tabled A-K while Thomas was in trouble with A-9. The board ran out Q 8 5 5 7 uneventfully, and Thomas was gone.